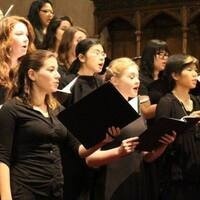 A joined choir concert at the beautiful Cathedral of the Annunciation. The concert will feature Pacific Choral Ensembles directed by Dr. Yejee Choi and San Joaquin Delta College Choirs directed by Dr. Bruce Southard. Patricia Grimm and Monica Swope - accompanists. The repertoire will include, among many others, works by Bach, Mozart, Gastoldi, and Sctütz.